Many riders agree that polycarbonate strength is an important benefit, but ask, "What about the clarity of the windshield?" However tough polycarbonate is, it's routinely subjected to surface deterioration from abrasion. Polycarbonate must be hardcoated to be optically clear enough for use as a motorcycle windshield. While some aftermarket companies use acrylic material, other companies use polycarbonate with the FMR hardcoating developed decades ago. Windshields will scratch and craze from road debris, the environment, UV exposure and simple daily use. That's why manufacturers protect the surface with FMR hardcoating. But National Cycle made a "quantum" improvement in the surface hardness of polycarbonate windshields exposed to years of wear. Our exclusive Quantum® hardcoating has become the new state-of-the-art for windshield scratch resistance and optical clarity. Nothing else compares – this is the toughest hardcoating there is! 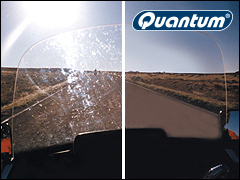 What Makes Quantum® Hardcoated Windshields Better Than The Rest? 30X more scratch resistance than typical acrylic windshields is saying a lot! Think of it as 30X more miles per windshield. Even compared to FMR coated polycarbonate, Quantum has 10X better scratch resistance. That's the kind of performance and strength you need from a motorcycle windshield! Ask your motorcycle dealer to show you our Quantum Scratch Test (shown at left). 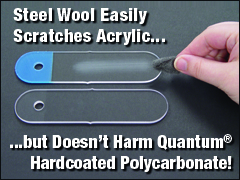 Try scratching the acrylic sample with the steel wool – it only takes a second. Then try scratching the Quantum hardcoated polycarbonate sample. Keep trying. Your fingertips will start to feel warm from the friction. Then you'll start to sweat. But there still won't be any scratches! Don't feel bad – we had the advantage. Think about riding into the sun at the end of the day, or riding at night with headlights and streetlights lighting up the glare of fine scratches that eventually accumulate on your windshield. That's not what you want in your line of sight when faced with oncoming traffic! Quantum hardcoating gives your windshield much better optical definition and clarity, and it will stay that way a lot longer! Watch the Scratch Test Comparison and see how National Cycle's exclusive Quantum® hardcoated polycarbonate compares to FMR hardcoated polycarbonate and to typical acrylic! Quantum® is an exclusive product of National Cycle, Inc.